On November 13, General Electric held its first investor day under new CEO John Flannery. 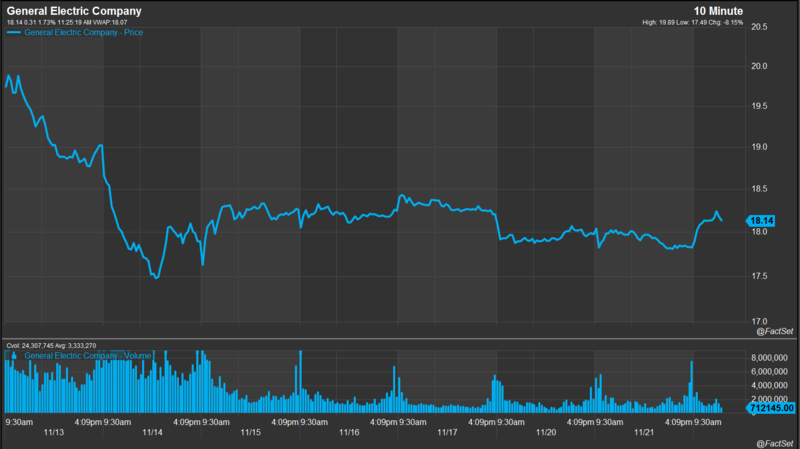 During the event, Flannery revealed plans for the 125-year-old company to undergo intensive restructuring, which sent the stock price down roughly 7%, the sharpest single-day decline since April 2009. While GE is no stranger to fundamental infrastructure changes, the ambiguity surrounding its plan to simplify operations has cast doubts among investors and analysts alike. Clear or not, the plan to create a smaller company with fewer businesses solidifies the notion that the era of conglomerates is coming to a close. The short- and long-term future of GE remains uncertain, but Flannery attempted to address those uncertainties when he said, “This is the opportunity really of a lifetime to reinvent an iconic company.” Investors hope he backs his optimism with aggressive acceleration heading into the new year. Flannery had previously stated that overdesign is one of GE’s weaknesses, and during the investor day event he stated, “Complexity hurts us. Complexity has hurt us.” His predecessor, Jeff Immelt, took over as CEO in 2001 and began to address this weakness, selling off several arms of the company, including NBC Universal and much of GE Capital. In an effort to accelerate the streamlining process, Flannery plans to sell or spin off many of GE’s operations in the coming years. In total, the company expects to generate nearly $20 billion through asset sales, which should help to address GE’s ongoing cash flow problems. GE’s Power, Healthcare, and Aviation divisions are responsible for over 60% of the company’s revenue, so they make the most sense as areas of renewed focus. By shedding other segments unrelated to these focus areas, GE can re-invest in itself and further its initiatives to become a digital leader in the industrial world. As GE sells and spins off various units (boxed in red), its sources of revenue will simplify, creating greater transparency across the company. 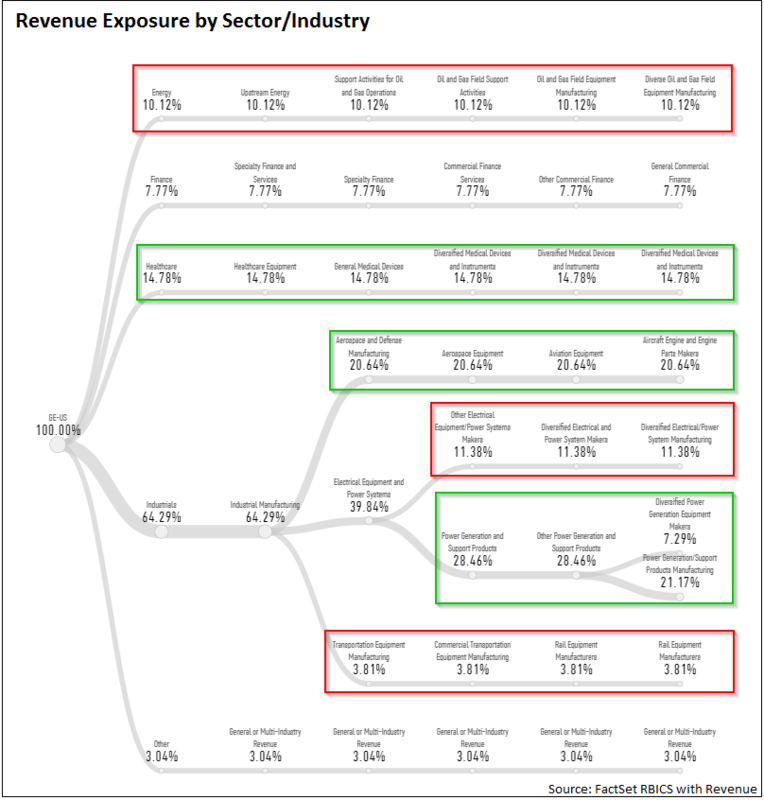 Its current revenue exposure, detailed by FactSet’s RBICS with Revenue in the report below, will likely shift dramatically as Flannery places focus on the three main business lines (boxed in green). If all goes according to plan, these three segments will represent an even larger portion of GE’s total revenue in the coming years, as part of a much more simplified corporate structure. As for the undesired business units, GE’s management must narrow in on exit strategies. Whether it be a high-profile sale to a direct competitor (NBC Universal) or a spin-off turned IPO (Synchrony Financial), GE is well versed in the world of divesting. Faced with at least three impending exits, GE may take a page out of its own playbook or explore other creative options. Using the transportation business as an example, GE may turn to a competitor in the industry to dispose of all or part of its assets. This segment, generating nearly $5 billion in annual revenue, only makes up 4% of GE’s total revenue and represents 5.5% of the greater Rail Equipment Manufacturers sub-industry. The competitors shown in the FactSet RBICS with Revenue report above are among the top candidates to purchase GE’s unwanted assets. Analysts and reporters have begun speculating on potential buyers; Siemens, Alstom, Bombardier, or even a Siemens-Alston merged company (under EU regulatory approval) have all been names tossed into the discussion. While each buyer may have specific needs to fill, they could all benefit from increased market share, diversified geographic footprint, additional niche business lines, and synergies of suppliers, partners, and customers. Still, GE may choose to steer away from an asset sale entirely. Until more information is made available, we can only speculate. The company will begin its “reset year” in 2018. Using the $4.2 billion in dividend savings combined with the anticipated $20 billion in asset sales, the company aims to re-allocate and re-invest in its core businesses. How quickly can GE mobilize its plan? Will asset sales alone solve GE’s complexity and cash flow issues? Who is willing to buy these unwanted business segments? These questions, fresh in the minds of the public, have created significant market uncertainty and sent the stock price down roughly 13% over the past week. John joined FactSet in 2016 and is based in Chicago. To date, 15% of the companies in the S&P 500 have reported actual results for Q1 2019.